An outdoor curling tournament has been called off because the emergency services said they could not guarantee the safety of players or spectators. The Grand Match, planned for the Lake of Menteith near Aberfoyle next week, would have been the first event of its kind for more than 30 years. The bonspiel would have involved 2,000 competitors from across Scotland. The decision was made by the Grand Match Committee, which is responsible for all aspects of the tournament. The sport's governing body, the Royal Caledonian Curling Club, said in a statement it was greatly disappointed the match could not go ahead. The club said the decision had been made after "extensive discussions" with the emergency services. The statement added: "It has not proved possible to address all health and safety concerns and receive the full backing of the emergency services within the timescales involved. "Without achieving this it would be impossible to gain the necessary insurance to hold the event. "Every possible effort has been made to facilitate this unique event but it has been acknowledged that public safety must remain the primary concern." The club's chief executive Colin Grahamslaw said the main issue was managing the traffic and the safety of potentially thousands of spectators. "I'm confident that the ice is the required depth," he said. "I understand the police do not want to encourage people to go onto frozen rivers and lakes without knowing what they're doing, but curlers have a vast experience of ice and what's safe to go on." He told the BBC News website he was certain a Grand Match could still take place and said the club would continue to investigate other possibilities. 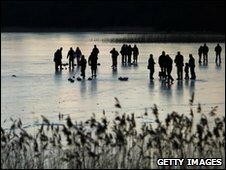 Curlers have been playing on the Lake of Menteith, which has not frozen sufficiently for curling since 2001, for the past week. The last Grand Match also took place on the Lake of Menteith in 1979. The one before that was in 1963. Central Scotland Police, who were involved in the negotiations, said they had a number of "serious concerns" about the proposed bonspiel. Supt Davie Flynn said: "We understand the attraction of such an event and recognise this is an unique opportunity for people passionate about their sport to participate in. "However, there are clear and obvious risks and the safety of the public could not be guaranteed." Supt Flynn said it was not known exactly how thick the ice was and that other public bodies were generally advising people not to walk on frozen lakes or rivers. He added that there were further concerns about the amount of traffic that would have been trying to access the event on rural B-roads.